Time for this week’s Quick Look Wednesday! I like all of these inks for different reasons. Private Reserve Ebony Blue – maybe my least favorite because it looks more like a green-black in my swabs. Have any of you tried writing with this one? Noodler’s Ottman Azure – boom! Pure blue saturation with this one. So, yeah, each of these are so different from the others and I like them all. Which is your pick? This entry was posted in INKS and tagged blue, de atramentis, diamine, noodler's, private reserve by Christine (Pentulant). Bookmark the permalink. I LOVE the Ebony Blue! Definitely my next ink purchase! Hi Pamela..thank you for stopping by! 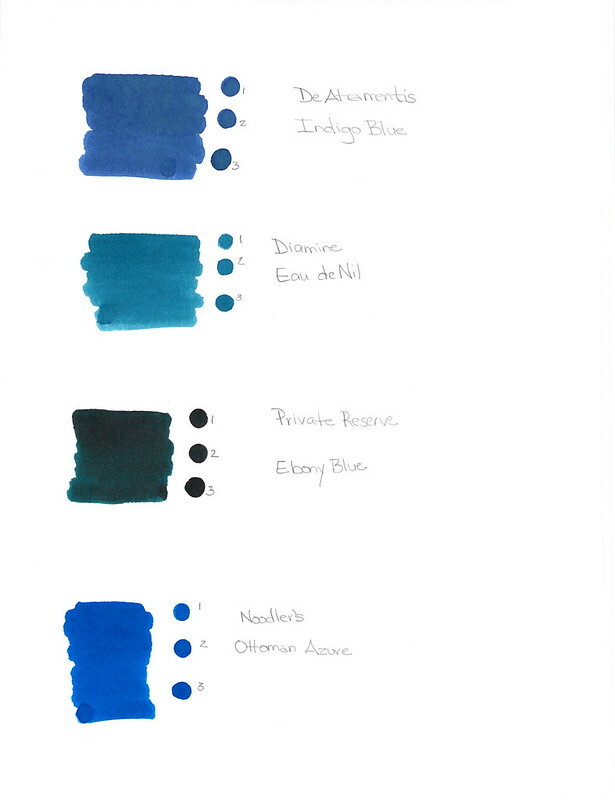 I'm going to give that Ebony Blue a try in a pen (rather than just swabs) very soon. Will post about it! In general, I love Private Reserve inks.